Yes. It is hard to believe that 29 years have already passed since that fateful day in September of 1984, when poor Gerald R. Ford, less than a decade removed from the nation's highest office, became trapped in an elevator. The story is pretty straightforward: The Van Pelt-Dietrich Library at the University of Pennsylvania was hosting an event to commemorate a new space in honor of Thomas Sovereign Gates, a former University of Pennsylvania president and a close acquaintance of Ford, who was planning to attend. 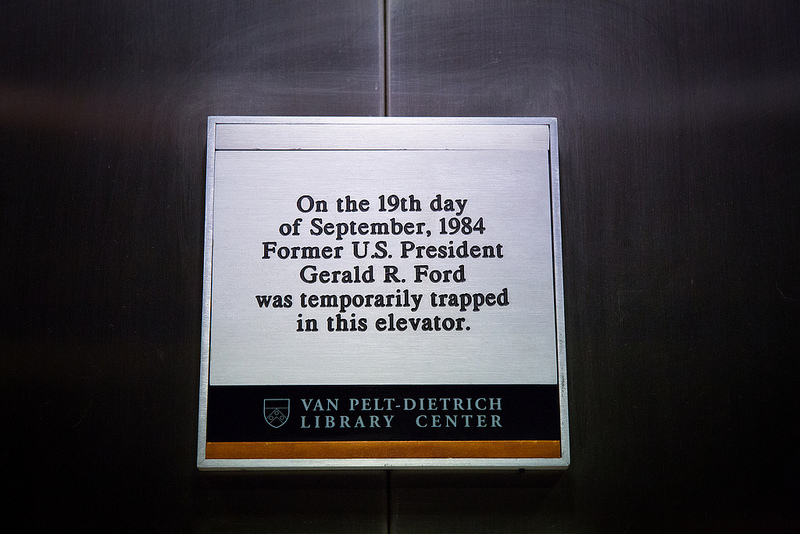 When Ford arrived, his car pulled up to the library's back entrance, and his security detail led him through the basement to a staff elevator that would carry him to the first floor, just outside the room being dedicated to Gates. Joe Zucca, UPenn's director for planning and organizational analysis, recounted the harrowing details of what happened next. "Ford got into the elevator," Zucca said, "and it stalled -- somewhere between the basement and the first floor." Zucca does not know if Ford was alone or had companions during his confinement. "I'm told by some of the people who are still here who were there that day that this precipitated a barrage of activity from the Secret Service," Zucca continued. "There were agents who were flying around the building, securing the areas, and getting some technical person in to free up the elevator." "Which they did, in a few minutes. Ford came out; he was in good humor -- jovial about the whole thing, and they went on with the commemoration." Editor's Note: For an actually harrowing tale of elevator entrapment, not to mention some of the best technology writing of recent years, be sure to read Nick Paumgarten's brilliant New Yorker piece "Up and Then Down." But proceed with caution if you like sleeping easy at night.